NADIA MURAD WINS 2018 NOBEL PEACE PRIZE! What an unbelievable day! Throughout its history the Yazidi community has survived 72 genocides and today our call for help has been recognized with the world’s highest honor. On that note, I would like to congratulate Nadia Murad and Dennis Mukwege on receiving the 2018 Nobel Peace Prize. The strength and courage that Nadia has demonstrated to bring the world’s attention to the plight of the Yazidi community and to victims of sexual violence at war has been awe- inspiring. I met Nadia at a refugee camp in northern Iraq in 2014, just days after she escaped ISIS captivity. As we sat together in a dusty tent, two Yazidi women from different continents with a shared mission, Nadia courageously broke her silence and shared her story. I would have never imagined that four years later we would be here. It is due to the bravery of women like Nadia, who ISIS attempted to destroy, that our call has been heard. This prize is a prize for all of the women who were held captive by ISIS. It is a symbol of hope. A symbol for a better future. With that, we must not forget that there is so much to be done. 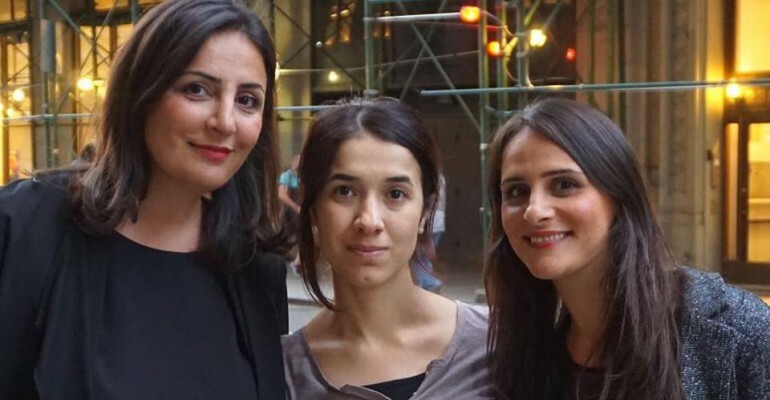 Thousands of women are still being held by ISIS and justice for the Yazidi people is far from being realized. As the founder of HAWAR.help, a humanitarian organization built out of the ashes of genocide, I will continue to fight for these women and pursue justice for the Yazidi people. Thank you so much for your support and for having been with us on this journey with us from the beginning. I would like to give a special thank you to the German Federal Ministry for Economic Cooperation (BMZ) and Minister Dr. Gerd Müller, for directly supporting these women through our Back to Life project in Iraq. What a wonderful day.